If you have a letterbox fitted into your front door, you can help reduce heat loss and draughts if you be draught proof it. Modern doors such as PVCu door will come fitted with a letterbox pre-installed and will have a flap on the outside as well as the inside so no further draught proofing is required. If however you have an older door and only a flap on the outside of the letterbox, for only a few pounds you can add an internal flap or a draught excluder. These are easy to fit and only take a few minutes. These draught excluders are readily available at DIY and hardware stores. Once you have bought one you simply need a drill, drill bit and screwdriver, an optional extra is a small level to ensure you fit the excluder level. The screws should be in the packet when you buy the excluder. There are two types of excluder available, a brush type that has brushes that help stop drafts, the same idea as the brush excluder you fit to the bottom of the doors. Two rows of brushes reduce the draught from coming into your property. 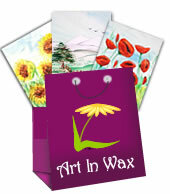 The other type is a brush with flap, these are slightly more expensive but do look neater. To fit both types of excluder simply align on the door, using a level to ensure it is straight, then drill pilot holes to take the screws. Then simply screw the two or four screws into the door to compete the job. 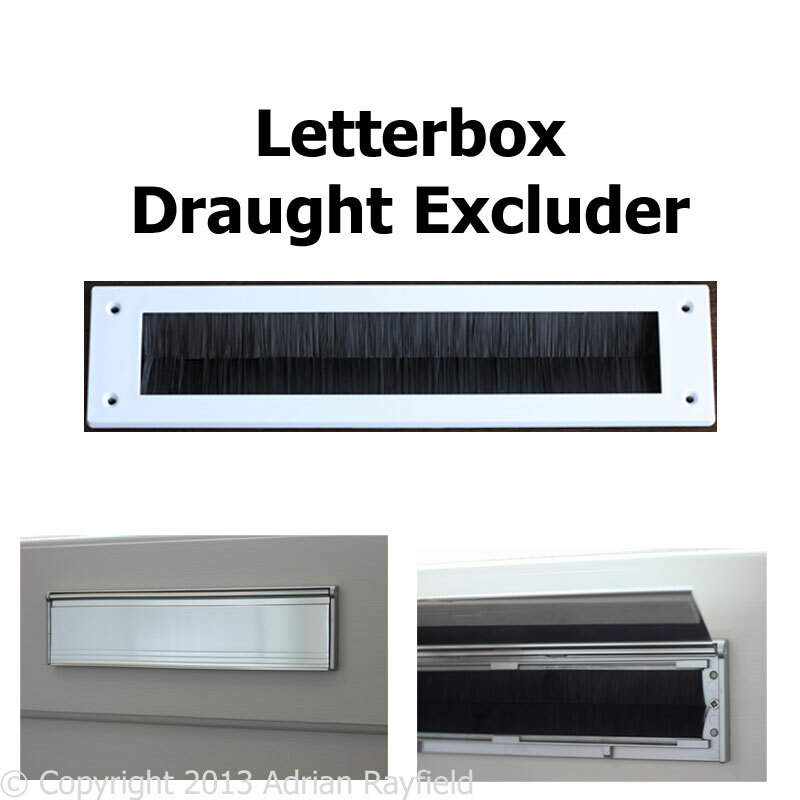 Both types of letterbox draught excluder are fitted internally. From time to time we have to paint pipes or pipework, this can be inside or outside a property. It could be plastic PVCu drainage pipes from kitchens or bathrooms, or maybe copper water pipes for heating etc. What ever the situation un-painted pipes can look unsightly, pipes look better painted. They maybe in a different colour, sometimes a different finish such as gloss or satinwood. To get a good professional finish you don’t want to get paint from the pipes onto the surrounding area, such as walls. 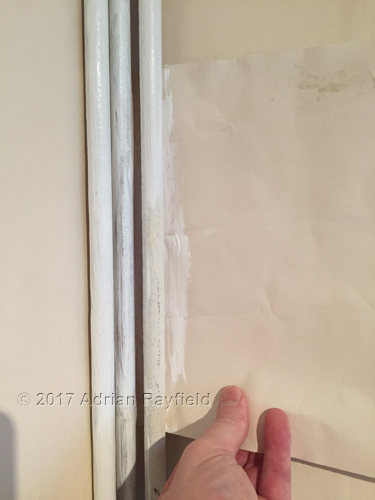 A good trick is to put cardboard of a sheet of paper or old wallpaper behind the pipes to protect the area behind getting splashed or the brush touching the wall as you try to get the back part of the pipes, once done you will have beautifully painted pipes and no paint on the walls behind. This tip works for all types of pipework, interior and exterior. To paint new copper pipes you need to ensure they are free from any plumbing flux and grease, so a wipe over with soapy water, methylated spirits or white spirit should remove this. With the pipes clean you can prime the pipes and then topcoat. I prefer satinwood but you can use gloss or emulsion. Oil based paints can yellow on hot water or heating pipes due to the heat. To paint previously painted copper pipes, give them a quick wipe over to remove any dust etc, gently rub down to give a key, prime / undercoat and them topcoat with your preferred paint. To paint plastic PVCu pipes, such as soil pipes, drainage pipes etc, ensure they are free from dirt and debris, including any plumbing grease etc. Give them a rub down with a fine grit sandpaper to give it a key, then prime, and paint with topcoat of choice.